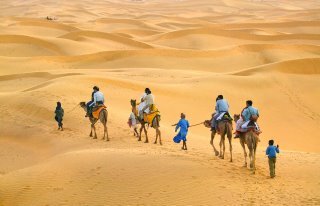 Bikaner is also called the camel country, being renowned for the best riding camels in the world. It is also the birthplace of the world famous Bikaneri bhujia and namkeen (a salted snack made of lentils). Being a desertscape, the summers are very hot in Bikaner. The best time to visit this place is in winters when the weather remains cool and tolerable. 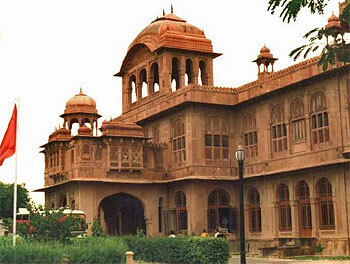 Bikaner offers several attractions to the tourists besides, of course, the exotic camel safaris. You can visit the majestic forts or go to the Mata Karni temple where rats are considered sacred and worshipped. The camel festival held in the month of January is also an event worth witnessing. Some of the major attractions around the city are Junagarh Fort, Lalgarh Palace, Camel Breeding Farm, Gajner Palace, Deshnoke Temple and Ganga Golden Jubilee Museum. Built by Maharaja Ganga Singh in memory of his father, the Lalgarh Palace is situated 3 km north of Bikaner city. Designed by Sir Swinton Jacob, the palace is quite imposing with overhanging balconies and delicate latticework. Peacocks and blooming bougainvillea in the garden welcome the visitor to the palace. To promote tourism, the Rajasthan Tourism Development Corporation has converted a portion of this palace into a hotel. Eight kilometres from Bikaner, the government-managed Camel Research and Breeding Farm is only one of its kinds in Asia. The farm carries out breeding and training of camels. The place located on the bank of the lake was the summer resort of the former kings. Today it has been converted into a hotel. garden and two large tanks at the eastern and western ends. The largest and most impressive structure is Gopal Bhawan inside which, even on a summer’s day, the air is cool and refreshing. Perhaps the most attractive part of the garden complex is the summer pavilion, Keshav Bhawan. On special occasions the 500 fountains around the pavilion used to spout coloured water while fireworks lit up the night sky. Some of these fountains still play during local festivals. Thirty kilometres south of Bikaner is the village of Deshnoke, where the famous Mata Karni Temple is situated. The 600-year-old temple is dedicated to Karni Mata, an incarnation of Goddess Durga. The temple has huge intricately carved silver gates donated by Maharaja Ganga Singh. 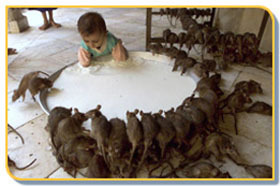 The temple plays host to thousands of rats that form the major attraction here. The rats are considered sacred and worshipped accordingly. You have to be very careful while entering the inner sanctum, because it is believed that if you accidentally step on a rat, a gold replica has to be made to compensate for the lost life. Just 32 kilometres from Bikaner, the Gajner Wildlife Sanctuary is home to a variety of wild animals. The adjoining lake that reflects the charming pink sandstone palace and gardens contrasts so effectively with the surrounding scrubland where black back, chital, sambhar, chinkara, nilgai, wild boar, rabbits, partridges, quail, and Indian bustard abound, that you wonder if it/’s real, or a desert mirage. From the paved terrace, you see jungle animals come down to the water for a drink. This lake attracts millions of migratory birds in winter. The Maharajah of Bikaner held house parties for shooting grouse, duck, and wild boar here. Bikaner's history dates back to 1488 AD when a Rajput prince Rao Bika ji a descendent of the founder of Jodhpur (1459 AD)., Rao Jodha Ji established his kingdom here. Bika Ji chose a barren land called "Jungladesh" and shaped it into an impressive city, called Bikaner after the founder's name. Archeological surveys and excavations have established beyond doubt that civilization flourished here even before the Harappa period . Excavated statues, coins and carvings of stones and clay stands as testimony to this fact. In the modern period Bikaner produced the most outstanding Ruler, namely Maharaja Ganga Singh who ruled for 56 years. He was a strong and able ruler who renovated the traditional administration, modernized the army, separated the judiciary from the executive, constructed the famous "Gang Canal" and provided a number of welfare schemes, hospitals. His son and successor Maharaja Sardul Singh, who ascended the throne in A.D. 1943, played a conspicuous role in the merger of the princely states in the Indian Union. His Nationalistic outlook shall ever be remembered by the citizens of Bikaner. His son Dr. Karni Singh made a mark in Indian politics and in the field of sports. Ever since 1952 General Elections he had been elected as member of Parliament continuously for five terms. He attained international fame in shooting arena. At present the city is developing fast into an industrial and tourism center.